You are currently browsing the category archive for the ‘Calligraphy （書道）’ category. I hope this new year brings us lots of joy and good health. This year I would like to make my workshop happen soon. Enjoy more calligraphy works with lots of people. This is a video I found very interesting. This is a show about Sumi Ink which we use for calligraphy practice. This April, I submitted my Calligraphy work to Shodo Canada. Well, as I was substituting yoga classes during April, I had not much time to practice for this. But I managed to mail it the day we were flying to Japan for a month. After the competition, I didn’t receive any awards but they framed my work and had an exhibition in Toronto last November. It looks nicer with the traditional framing. My work is in the middle “Hisshin”. I will try my best next year as well. If you are practicing Japanese Calligraphy, please consider to enroll in the competition next year! Have a wonderful brush days!!! 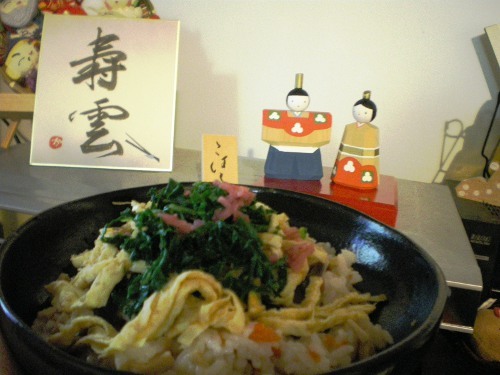 Welcome to Kazuko Ikegawa’s blog. I will add more my work photos and activities.